Stockholm – June 27, 2017 – Prestigious, four-diamond luxury hotel, InterContinental® Toronto Centre Hotel, announces the successful implementation of ASSA ABLOY Hospitality’s industry-leading RFID locking solution and Visionline system to update and enhance overall property security at the glamorously-appointed 584-room property located in downtown Toronto, Ontario. 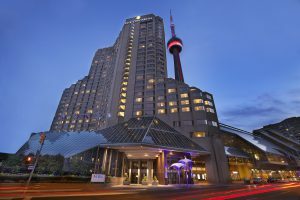 The InterContinental Toronto Centre is managed by InterContinental Hotels Group, operator of 12 brands stretching over 100 territories and countries. After successfully using ASSA ABLOY Hospitality’s VingCard Classic locks and Vision solution for some time, InterContinental Toronto Centre has completed an upgrade of its guestroom locking system to incorporate the latest advances in RFID-based technology. The most recent RFID upgrade creates an even more effective locking system for the hotel, eliminating the potential for unauthorized access, keycard cloning or demagnetization, as well as bringing greater opportunity to create site-specific programs for doors and certain areas of the property. The VingCard Classic RFID and Visionline wireless security solutions work in tandem to give InterContinental Toronto Centre more control over who enters certain areas of the hotel and when. The two solutions now allow hotel staff to remotely monitor who is accessing restricted sections of the property, and if any keycard is suspected of being tampered with or used inappropriately, staff can quickly deactivate that keycard to prevent further unauthorized use. InterContinental Toronto Centre can now offer guests more keycard options, such as stand open cards and one-time use cards. Through increased flexibility within the system, management is able to create staff user groups and control staff access across the property in one central location. ASSA ABLOY Hospitality is showcasing the latest in RFID technology as well as its other innovative solutions and technologies during HITEC Toronto 2017 this week at booth #1101. For more information or to schedule a media interview at the booth, please contact Dina Magdovitz at Dina@planapr.com. To learn more about ASSA ABLOY Hospitality and its comprehensive line of locking solutions, please visit www.assaabloyhospitality.com.